Today is the 100th anniversary of the first day of the battle of the Somme. Here is EBF’s tribute to the brave men and women of all races and religions who fought alongside Britain over the years. This PDF download was originally posted as a series of articles on the EBF blog throughout Armistice Day 2015. So far we’ve posted blogs about historical wars and the heroic men and women who fought and died to preserve our freedoms. In the last blog we commented upon those brave soldiers, sailors and aircrew who continue to face dangers across the globe. And throughout it all we’ve hardly mentioned Britain First or the perils of modern Nazism. That’s not like us, is it? In this final Armistice Day blog we’d like to invite you to think – really to think about what this country fought against during World War II. What would the world be like, what would Britain be like if Hitler’s jackbooted bully boys of the SS and the Gestapo were in charge? If you’re at all unsure of the answer to that just think about what happened in occupied Europe when the Nazis were in power. Think of the enslaved Slavs, the murdered children, the euthanised disabled, the dispossessed non-Aryans and the imprisoned, tortured and executed politicians whose ‘crime’ was to disagree with fascism. 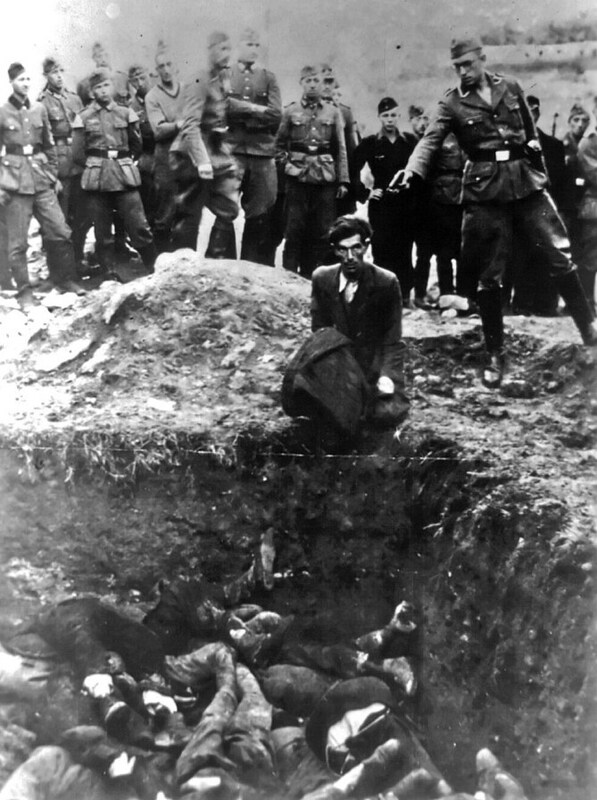 Think of the religious faithful, not just Jews but many Christians too who, unwilling to swear allegiance to Hitler were persecuted and exiled. Think of the gas chambers and the labour camps. Think of the brutal regime that saw twins, mainly children tortured to death in the name of Nazi ‘science’. 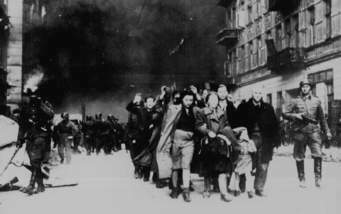 Think of the Jews forced to endure extreme cold until they died of hypothermia to help develop warm flying jackets for the Luftwaffe. 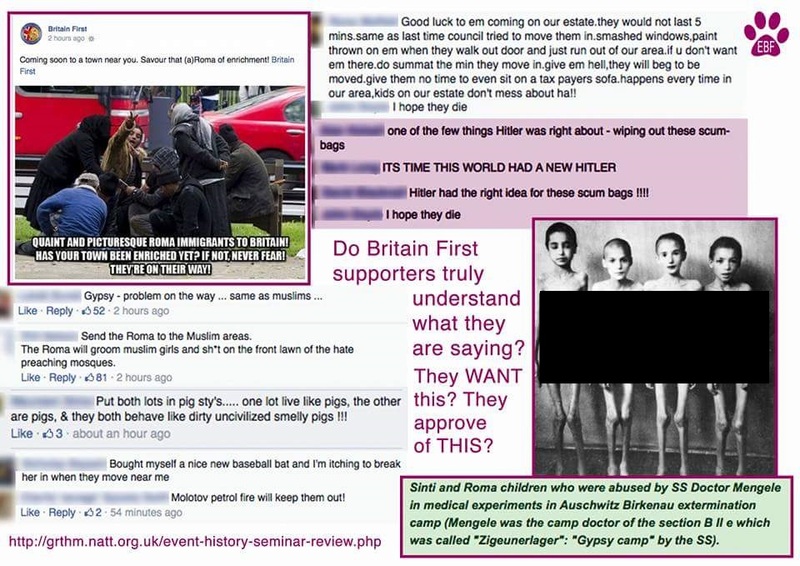 Think of the horror that is Nazism and then, think about Britain First, its threats to all who disagree with Nazi ideology, its incitement to murder Muslims (just as Hitler incited murder of the Jews), its contempt for law and order and its open hostility to human rights. Think of the Biffers’ hatred of Islam and the way they deceive to make Muslims look like a threat. How can anyone support Britain First and still respect the men and women who fought and died to defeat the Nazis in World War II? Our ancestors most certainly did not fight World War II so that we could hand power to British Nazis 70 years later! 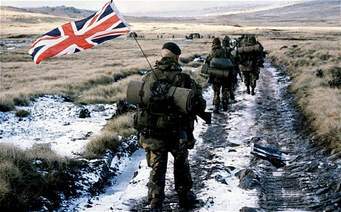 Since the end of World War 2 the British military continues to be involved in conflicts across the globe. Some of these operations are easier to justify than others. The British support of America in the first and second Gulf wars for example attracts a great deal of criticism and condemnation. But that’s not the point of this series of Armistice Day blogs. Politicians start wars but servicemen and women are the ones who fight them. Today we honour the individuals who find themselves under fire, regardless of the political process that placed them there. Those arguments are for another day. From Belfast to Iraq, from The Falkland Islands to Afghanistan, British and Commonwealth fighters have risked their lives in the name of Queen and country every day and they continue to do so. Armistice Day on the eleventh day of the eleventh month recalls the end of the Great War but remembrance must encompass more than that. Here at Exposing Britain First we’d like to say thankyou to all those who serve in defence of our country and its freedoms. It’s true that sometimes we wish there might be a better way to deal with the world’s problems but that doesn’t detract from the courage individual military personnel show or from the fact that they deserve our respect and our thanks for having the courage to do what most (but not all) of us in Team EBF can only imagine. To the men and women of the British army, the Royal navy and the Royal air force… we salute you! When you buy your poppy this year, wear it with pride to honour the men and women who continue to face the dangers of war across the globe. Yes, it’s true. We promised not to mention the Biffers at all on the EBF blog today but some things just need to be said. 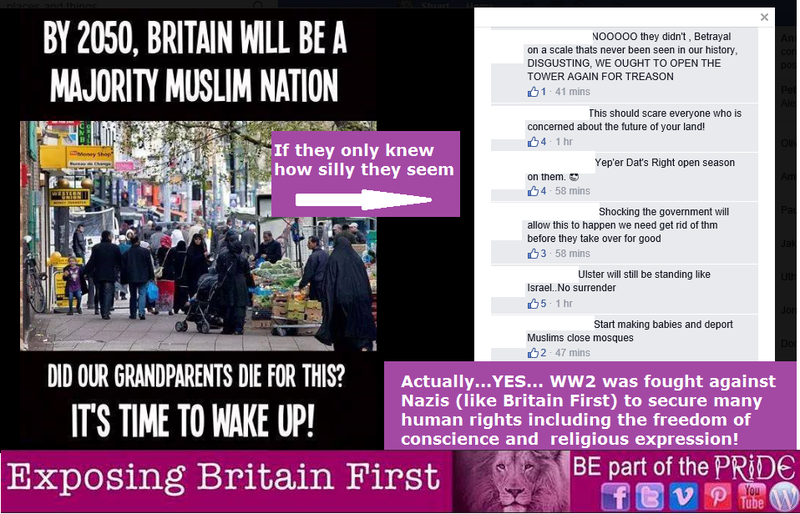 Britain First regularly publishes false information about Muslims persecuting other religious groups, especially Jews and Christians and they often point to the weakest of historical events to try to prove it. In truth the record of history tells a very different story that our next hero illustrates so well. Abdol-Hossein Sardari was the Iranian ambassador in Paris when the occupying Nazis began rounding up the country’s Jews for forced labour or liquidation. As we have already seen they did this because of an ideological assumption that was based not upon observable science but on blind faith. The Nazis did try to evidence their claims about racial purity, even financing extensive but fruitless archaeological expeditions in the attempt but they could not. There was no evidence to be found because the cultural construct of race makes no significant sense anyway in any reasonable context. Abdol used this lack of evidence to his advantage. If there was no real evidence to support the Nazi claims about racial purity, there was no need to worry about finding any. All he’d need then would be an emotive argument, persuasively delivered. That was all the Nazis had needed to consign central European Jews to their labour and death camps so presumably it would work in reverse too. Speaking first on behalf of his own nationals, Sardari was able to convince the German authorities that Iranian Jews were genetically different from the rest of Jewry. They were descended from a different blood line and therefore not ‘tainted’ by the genealogical deficiencies of other Jews. He invented an entirely fictitious collection of research that ‘proved’ that Persian and Iranian Jews weren’t Semitic at all. He actually convinced the Nazis that ‘his’ Jews were really pure Aryan’s, like themselves! In other words, Iranian Jews were most definitely not ‘Untermenschen’. Having nothing beyond a perverse sense of their own ‘righteousness’ and ‘purity’ to guide them the Nazis fell for it, hook, line and sinker. Iranian Jews were spared the holocaust. But Sardari didn’t stop there. Since there was no objective geneological evidence underlying the policy, all a Jew needed to be saved was an Iranian passport. Provide the illusion of citizenship and the Nazis, like the Angel of Death at passover, would simply move on. Actually there was nothing ‘simple’ about it. Abdol-Hossein Sardari ran considerable personal risks, arranging Iranian passports and documents of citizenship for countless Jews. He had no authorisation from Iran to do this. Sardari was actually recalled by the Iranian government but he refused to comply. He remained in Paris, using his own considerable fortune to fund the elaborate deception and escape plan. Estimates vary but the lives he saved certainly ran well into the thousands if not the tens of thousands. Had Sardari been discovered in his clandestine mission of mercy he would almost certainly have died. Yet his faith in Jihad, in the Islamic struggle to be righteous drove him, as it has so many others to protect the weak, the helpless and the non-combatant. Taking his inspiration from the Koran he held so dear Abdol had no option but to follow the demands of his religious conviction and risk everything in the name of peace and justice. So the next time you read about the alleged hostility of Islam, remember Abdol-Hossein Sardari and the many like him who’s personal Jihad, what Muslims know as the ‘greater’ Jihad, was to be the best, most compassionate and most honourable person he could be, even in Nazi occupied France. When you buy your poppy this year, wear it with pride in honour of Muslim men and women like Abdol-Hossein Sardari. It’s their poppy too! 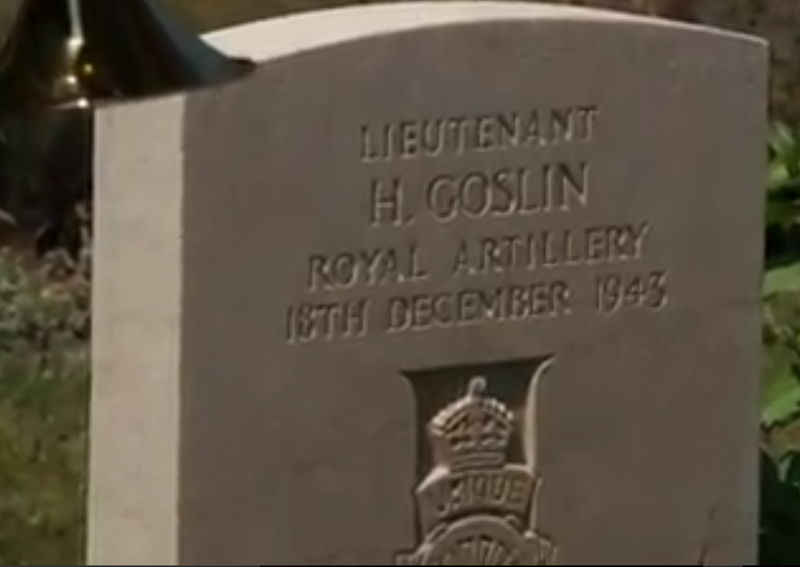 When you buy your poppy this year, wear it proudly in honour of Lt. Harry Goslin and all who lie alongside him in that Italian war cemetery. My grandparents were immigrants. But just as the vast majority of modern immigrants, they were more than worthy of their place in our society. As with most of our grandparents, they didn’t talk too much of their trials during WWII but this is their tale, as accurate as I can make it. Dziadek (Polish for grandad) was a young man from Postawy in Eastern Poland. He joined the army and fled along with thousands of compatriots when Germany annexed the country. Why did they run? Why didn’t they stop and fight? Sounds familiar huh? Imagine charging Panzer Divisions on horseback or trying to shoot down Stukas with antiquated rifles…..Damn right you’d run! Anyway, he eventually made his way across Europe and ended up in Scotland, where the 1st Polish Independent Parachute Brigade was formed. They were formed intending to drop into Poland and assist in the liberation of their homeland but the British government pressured them into joining Operation Market Garden. On September 18th 1944 they were due to drop, alongside the gliders of the 1st British Airborne at Arnhem in Holland in an attempt to push German forces south, toward France and the allies advancing from that direction. Bad weather meant the British gliders were able to deploy but it was too bad to parachute in so the Poles followed three days later, out of position, on the wrong side of the Rhine and where the Germans were waiting. Meanwhile, in Warsaw, Babcia (grandmother) was fighting her own battle alongside the Polish Resistance. On August 1st 1944 the Russians were advancing from the east and liberation was imminent. The sound of Chopins Polonaise rang through the streets of Warsaw, signalling the start of what was one of the bloodiest battles of the war. The Russians halted outside the city so the Poles were left to battle against a far superior army, with spontaneous help from allied air forces. Over the course of two months around 20,000 Poles were killed, wounded or went missing in action compared with nearly 23,000 German troops. 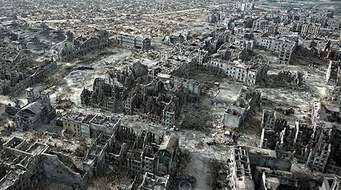 Nearly 200,000 civilians were killed and a further 700,000 were displaced due to the near-total destruction of the city. They spent a brief couple of years in Germany where my father was born and then decided to move to Britain as many Poles who’d fought alongside British forces did. They didn’t have much choice anyway, Dziadek’s hometown was now part of Belarus after the allies carved up much of Poland and Warsaw was all but levelled. Looking back now I wish I’d questioned them more on their experiences but they were proud, strong people and it didn’t seem right to drag up their past and memories they might not want to recall. When you buy your poppy this year, wear it proudly and remember those brave poles who sacrificed so much for all of our freedom. On September 1st 1939 the German army invaded Poland. The successful Blitzkrieg (lightning war) tactic of swift invasion supported by armoured artillery, rapidly moving infantry and massive air support got them to Warsaw with remarkable speed and the city fell, effectively signalling the collapse of Poland itself on September 17th. Unable to continue the defence of their homeland, many Polish pilots and air crew fled to France where they joined the French air force and returned to the fray as the Germans continued their advance there. Once again however they were defeated. 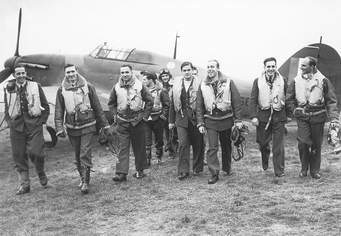 Undeterred, the surviving Polish pilots and air crew made their way to Britain and the Royal Air Force. 302 Squadron was formed on July 13th 1940 with 303 Squadron close on its heels coming into existence on August 2nd. Both squadrons fought in the Battle of Britain, the gallant action that drove back the Luftwaffe, prevented Germany from establishing air superiority across the channel from France and thus forced Hitler to abandon Operation Sea Lion (AKA the invasion of Britain). These two squadrons, although late to the Battle of Britain were responsible for one fifth of all German planes shot down over Britain. Without the aid of these 139 Polish airmen (303 squadron shot down more German planes than any other RAF Hurricane squadron) it is doubtful that the German invasion would have been halted. Britain may well have been occupied. That in turn could easily have resulted in a quick victory for Germany and for Nazism throughout Europe with no effective opposition to launch a counter-attack. Without Britain’s continued resistance to the German war machine there would have been little or no commonwealth involvement and the Americans would have ignored Europe completely, concentrating all their forces upon the Pacific war with Japan instead. To put it another way, without the Polish airmen of 302 and 303 squadrons Germany would almost certainly have won the Second World War. And it wasn’t just the Polish pilots we need to be grateful for. In total around 17,000 Polish nationals fought for Britain. They represented their country (and ours) over air, land and sea and bled just as deeply as any Brit in the defence of freedom from Nazi totalitarianism. When you buy your poppy this year, wear it with pride in honour of the Polish flyers who fought and died in defence of Britain. It’s their poppy too.